A long time associate of mine, Dr Mikhail Teppone, send me his latest paper on the modern view of the theory of Channels, Collaterals, and organs. I am re-posting his papers here, and if you are interested to find out more, please contact Dr Mikhail. His contact details can be found in at the end of the article. The theory of Channels, Collaterals, and Organs is one of the most important but at the same time, one of the most difficult in Traditional Chinese Medicine (TCM). Do we need to preserve the original TCM lingo or is it possible to match the TCM terms with their equivalents in modern medicine? The authors review the main ideas about Channels and Organs theory and provide their own explanation. We believe that ancient Chinese doctors understood the complexity of the human body and divided it into 2 morpho-funcional parts: cells and intercellular spaces. 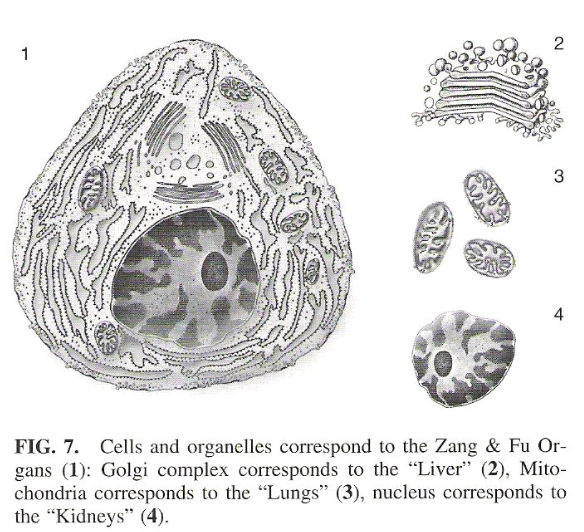 Through the theory of channels and Collaterals, those physicians described physiology and pathology of intercellular spaces and by the theory of Zang and Fu Organs, they described cellular physiology and pathology. IN THE DEVELOPED WESTERN COUNTRIES, people are increasingly aware of different types of alternative medicine. Despite the growing interest, alternative medicine has not yet been integrated into the mainstream healthcare system. Therefore, still remaining are 2 separate forms of medical practice, Modern Western and Traditional Eastern or Chinese medicine. No doubt perhaps, the future of medicine lies in the integration of modem technology and the extensive wisdom and experience of Eastern healing methodology. The main obstacle for such integration is the difference of views on the nature of human organism, methods of diagnosing and treatment, as well as vague terms used in Traditional Chinese Medicine (TCM). interchangeably with those of sympathetic and parasympathetic nervous systems, various hormones, endorphins? After reading, our hope is that vague and unknown words will take on a new, deeper meaning in relation to the universal laws of nature and human development. Our desire is that TCM will become vital and accepted in the modern Western world. According to the TCM theory of energy, Qi circulates through the human body via special pathways known as Channels and Coilaterals. This process supports normal organ and body functions. When disease occurs, the cause may be internal (hereditary or congenital Ql disorders, strong emotions, etc) or external (Wind, Heat, Cold, etc). Pathological conditions in TCM can be attributed to abnormal circulation of Qi and blood, which results in a state of excess or deficiency of organs and channels. Therapeutic methods used in TCM restore balance of Qi and blood between various points in the body. The terms used in TCM first appeared in the ancient oriental philosophy and have very broad meanings. Modern science, on the contrary, employs terms with precise and exact definitions. Therefore, any attempt at literal translation of TCM terms into modern language directly would result in a loss of meaning and essence of that particular term. TCM theory can be represented as a simple mathematical model which would show the relationship between physiological and pathological laws of human organism. When we apply this model, where TCM terms and principles resemble elements of algebraic equation, we can understand an individual patient problem and find specific treatment approach. This is also true in cases of unknown etiology and pathogenesis where diagnosis and treatment are yet to be developed. The skin of both human and animal is characterized by morphological and functional heterogeneity. The same is true for bodies of plants and insects. 1’2 In TCM, this heterogeneity is described as Acupoints, Skin Zones, Channels, and Collaterals. Besides electrical heterogeneity, acupoints have other specific characteristics such as low frequency oscillations (7—10 and 15 20 spontaneous visible light emission,14 increased accumulation of radioactive phosphorus, 15 increased sensitivity to high frequency electromagnetic radiation, 16’17 high conductivity or natural electromagnetic radiation from the sun, 18 etc. This electrical heterogeneity of skin can still be detected during the first few days after death.2•19-21 However, due to autolytic processes occurring in the cell post mortem, the physical parameters of skin gradually equalize and electrical heterogeneity disappears. Taking into account the above information—as well as the Chinese term for acupoint, kong xue, which means fissure or crevice—we can conclude that acupoints are places in the skin where connections between the epithelial cells are not tight, thus providing an entrance into the body. 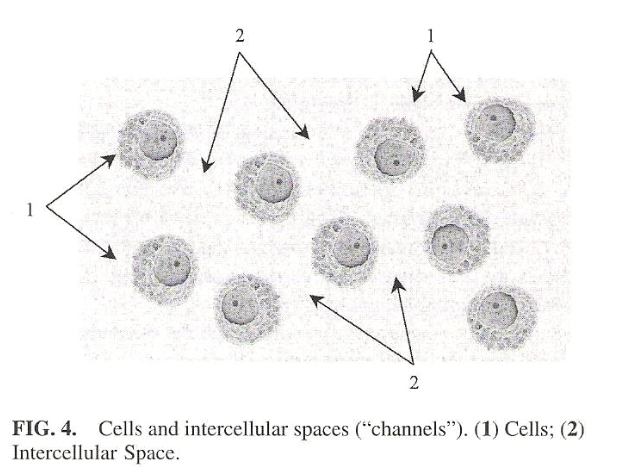 The site of acupoints contains large numbers of active elements, which make it a complex functional unit that provides interaction between internal body environments with its external surrounding (Figure 2). Qi and blood Circulate in the human body along Channels and Collaterals. There are 12 main channels and their secondary vessels which supply normal function and defence of the human body by means of circulating Qi and blood. The modern science approach suggest the presence of correlation between structure and function of a biological object. Presently, no specific structure has been found to identify the channels. But, sometimes the absence of structures can make way for a new function. For example, the “door or window aperture,” “river bed,” or “gap” all provide conduction or passage. The main function of the channels is to conduct: electrical current, warmth, light, etc so that Qi travels along the channel. Channels can best be described as a network of gaps stretching along the well known anatomical structures. The inner channel walls are formed by the surfaces of muscles, bones, tendons, vessels, and cells. These channels are filled with fibrous connective tissue, electrolytes, and structured water molecules.30’31 We presume that to be sufficient to ensure Qi conduction. Though basic, the channel system connects other more complex regulatory systems and provides interaction of inner organs with outside environment. by inflammatory symptoms such as localized redness, hyperthermia, hyperesthesia, edema, and pain exacerbated by pressure, this type of abnormality can be described as “Excess of the Tendino-MuscuIar” channel. If skin changes its integrity, as when a keloid scar or ulcer is present, this would point to a disorder of the Luo channel. 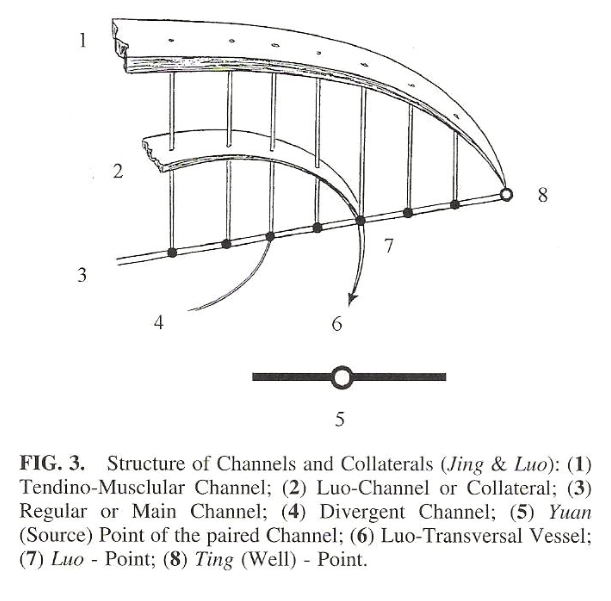 Governor Vessel is a typical example of the gap model of a channel. It originates in the kidney, extends down to the perineum through the uterus or prostate gland, and then, one of the main branches ascends through the vertebral column. The point of GV 16 (Fong Fu) gives birth to the branch, which enters the skull. Its main pathway lies through the top of the head and ends at the upper lip. 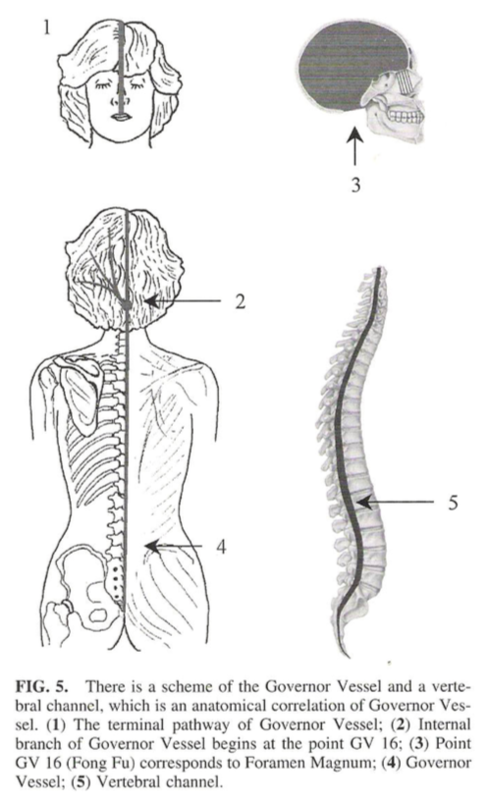 What is an anatomical equivalent of the Governor Vessel: spinal chord or vertebral column? We believe that Governor Vessel is a vertebral channel; GV 16 (Fong Fu) corresponds to Foramen Magnum at the occipital bone. Therefore, the branch of Governor Vessel penetrating the skull is the extension of the vertebral channel into the skull through Foramen Magnum (Figure 5). In much the same way, we can analyze Conception Vessel and describe its relationship to the chest, abdominal, and pelvic cavities. Therefore, both Governor and Conception Vessels are cavities themselves, regulating the function of their respective organs. Hence, channels are not organs, tissues, or cells but various body cavities. This approach is not yet integrated in modern Western medicine. (hollow) organs. 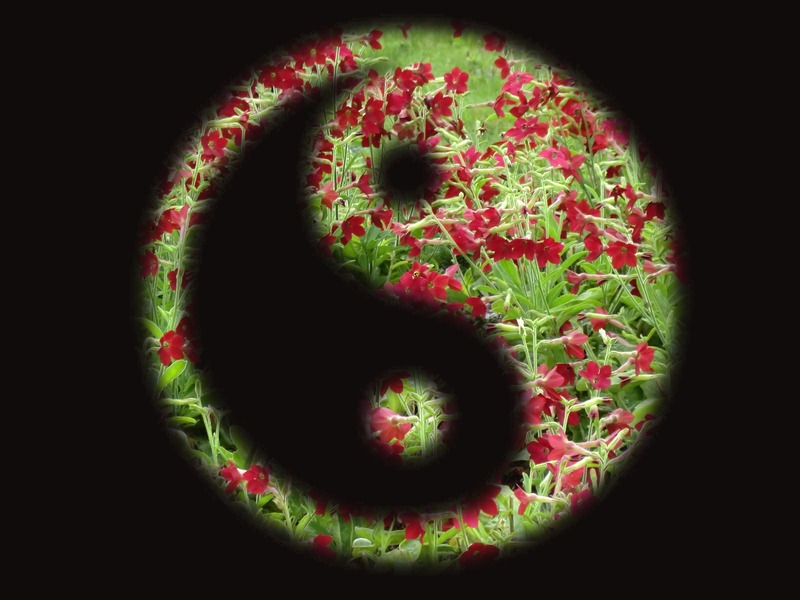 These organs are divided into Yin-Yang related pairs, which form one of the Five Elements. Zang or dense organs have inner cavities (bronchus, bileducts, renal calyx, pelvis, etc and correspond to Fu or hollow organs (Figure 6). 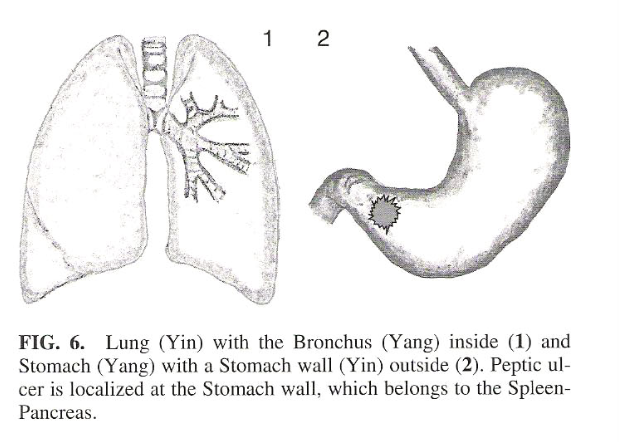 At the same time, Fu organs have solid walls, which correspond to the Zang organs (Figure 6). Thus, Zang organs contain Fu properties inside, and Fu organs contain Zang properties outside. Therefore, a renal calculus is actually located in the Bladder Channel and peptic ulcer will need treatment of the Spleen Channel. more complex substances; the function Of regulation of differentiation, development, and death of cells belongs to the nucleus (Figure 7). Thus, the concept of organ in TCM includes the set Of cellular and intracellular structures that carry out certain functions. For example, Lung involves all structures that facilitate diffusion and transport of gases (02 and C02) as well as oxidative phosphorylation and synthesis of ATP molecules. Therefore, regardless of the cause of “breathlessness” or shortness of breath from the modern perspective, the points on the channel of Lung are used to treat it. Scientific medicine made a large step ahead when R. Virchow claimed that disease was pathology of cells, but at the same time, any extracellular disorders were almost ignored or deemed “functional diseases.” Conceivably, the conception of “cellular medicine” was a reason why Traditional Chinese Medicine’s ideas about “holes, channels,” or “tunnels” distributed into the human body have been hard to become accepted. We wish to thank Oxana Teppone-Martin, RN, BSN, CCRN, who helped to translate this article from Russian into English. l. Madoli D. Light-guiders at the plants [in Russian]. In the World of Science. 1984;10: 66-72. 2. Zhyrmunsky A, Karpenko A, Kochetkov Y. Study of electrical resistance of the cornweevil larva cover [in Russian]. USSR Acad Sci Rep.
3. 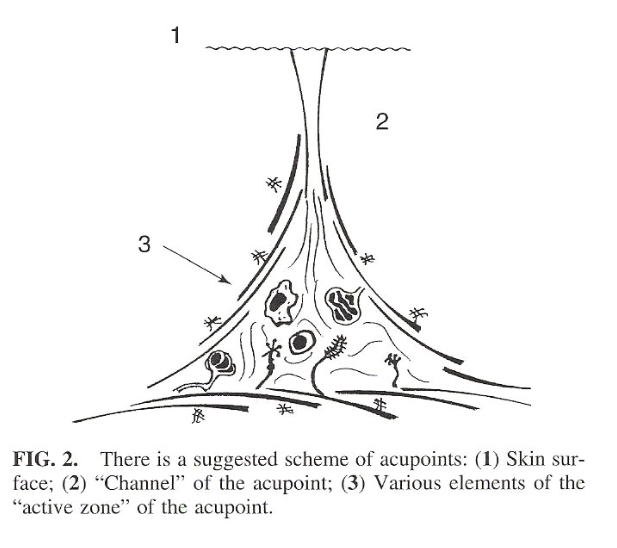 Cizek M, Szopinski J, Shrypulec V. Investigation of morphological structure of acupuncture points and meridians. J Tradit Chin Med. 5. Mmshansky V, Markov Y, Shpunt V, et al. Topography of the gap contacts (junctions) and its possible role in the non-nerve conducting of information lin Russian]. Arch Histol Embryol. 7. Zhang K, et al. A morphological study on the receptors of acupuncture points. J Tradit Chin Med. 1982;2(4):251—260. 9. Niboyet J. La moindre resistance a l’electricite de surfaces punctiformes et de trajets cutanes concordant avec les “point et meridiens” bases de l’acupuncture. Marseille: 1963. 10. Podshibiakin A. Importance of skin active points for experiments and clinic [dissertation in Russian]. Kiev, Russia; 1960. 1 1. Portnov F. Electro-puncture reflex-therapy [in Russian]. Riga, Zinatne; 1987. 12. Avagyan R, Teppone M. Acuvision: a new solution of the acupoint visualization. In: Acupuncture in Modern Society. Abstracts of the 5th International Baltic Congress on Medical Acupuncture and Related Techniques, Jurmala, May 28—31, 1998:3. 13. Mirkin A, Nechushkin A, Skvorchevsky A. et al. Study of oscillation process in acupoints [in Russian). In: Modern Problems of Reflex-diagnostic and Reflex-therapy. Rostov on Don. 14. Yan Z A study on the pathological illuminating signal point investigation Of subjects. J Tradi.’ Chin Med. 15. Pokalev G. Radioactive phosphorus (P-32) inclusion into active points of the skin. In: Proceedings of the 4th Scientific and Applied Conference on Reflex-therapy by Means Of Zhen Jiu Methods. Gor’ky, Russia; 1962:11-12. 16. Andreev E, Bely M, Sity•ko S. Reactions of the human body on the electromagnetic fields of MM band lin Russianl. Vestnik USSR AcadSci. 17. Buvin G., Berlin Y. A device for reflex diagnostics with the help of the microwave methods lin Russian l. In: Modern Problems of Reflexo-diagnostic and Reflexolherapy. Rostov on Don, Russia: 1984:186-187. 18. Pakula A. Biological active points (BAP): chronobiological aspects. In: Chronobiology and Chronomedicine. Moscow, Russia; 1981:19-21. 20. Goidenko V. Lupichev N. Study of the abnormal electrical parameters of the human corpse skin lin Russianl. Modern Problems of Reflex-diagnostic and Reflex-therapy. Rostov on Don, Russia; 1984:19-21. 21. Niboyet J. Compléments d’acupuncrure. Paris, France: D. Wapler; 1955. 22. Durinian R. Methodological and physiologic analyze of the aspect of acupoints. meridians and energy in reflexo-therapy [in Russianl. In: Theory and Application of Reflexolherapy. Kishinew, Russia; 1. 23. Lang W. Acupuncture und Neural System. Ulm; 1957. 24. Ji Z. Studies on propagated sensations along channels. J Tradif Chin Med. 25. Makaz V. The question about bio-electroconductivity between the biological active points in Russianl. In: Modern Problems of Reflex-diagnostic and Reflex-therapy, Rostov on Don, Russia; 1984:7S-77. 27. Romodanov A, Bogdanov G, Liacshenko D. Initial Mechanisms of Acupuncture and Moxibustion lin Russian]. Kiev, Russia: Vicsha Shkola•, 1984:112. 28. Kaznacheev V, Mikhailova L Bio-informative function of the natural electromagnetic fields lin Russianl. Novosibirsk. Russia: Nauka (Science); 1985:178. 29. Vernejoul De P., Albaréde P, Darras J-C. Étude des méridiens d’ acupuncture par les traceurs radioactifs. Bull Acad Nat Med. 1985. 30. Ho M-W. Knight DP. The acupuncture system and the liquid crystalline collagen fibers of the connective tissues. Am J Chin Med. 31. Umanskaya A. A method of development and supporting of the body adaptive reactions lin Russian l. Certificate of miority No. 3560351/281i13, 15.03.83 (SU Il 14420 A) 2309.84 Bulleten No. 35. 32. Khan KB. About “Kenrak” System lin Russianl. Novaya Korea (New Korea), KPDR: Pyongyang. 33. Wu J, Van Yushen A. Hundred Answers to ‘he Ques,’ions About “Zhou Yi” ltrans from Chinese]. Kiev, Russia: Nika- Center; 2001:312. 35. Savina Rybolovleva E. Zavakina R. Affection of geomagnetic activity on the parameters of electro-status of the healthy people lin Russianl. Bull Siberian Dept USSR Acad sci. 37. Zhyrmunsky A, Kuz’min V. The 3rd regulatory system of human and animals is a system of acupoints. J Gen Biol. 38. Stiefvater EW. Akupunktur als Neuraltherapy. Ulm-Donau: Haug; 1956.